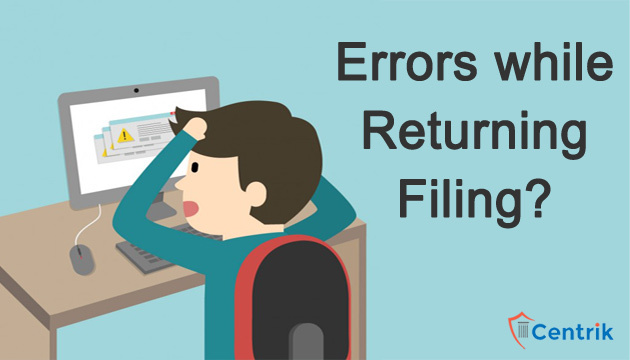 How to tackle errors while filing GST Returns? CentrikBlogsTax AdvisoryAll About GSTHow to tackle errors while filing GST Returns? Goods and Services Tax (GST) Returns can be filed online with JSON File on the GST Portal. In our recent update, we have already shared on how to convert JSON File to excel format. In case you face any issues you can follow the procedure mentioned in the update. This error will appear while uploading a JSON File on the GST Portal when JSON File is not recognized or some structural error in JSON File. Make sure that GSTIN is mentioned in the JSON File. You should upload most recent JSON File with correct GSTIN. In case the error still lingers, you can download the latest version of GST software and prepare the JSON File. You can also contact the GST Software provider for any support. The error message for this will be “The GSTIN is invalid. Please provide a valid GSTIN”. Reason being the GSTIN mentioned in the JSON File does not meet the GSTIN of the customer. Make sure that JSON File uploaded is uploaded to correct GST account. Make sure that GSTIN mentioned in GST Software is correct for preparing JSON File. You can easily change the GSTIN in JSON File, save and then again try uploading it. It is compulsory that GSTIN’s of the customer is valid. This error will show a message saying “Date is Invalid. Date of the invoice cannot be before registration date”. According to this, the date mentioned on the invoice is prior to the GST Registration of the customer. The customer, in this case, a customer will not be eligible to claim input tax credit. Therefore, the date of the invoice must be changed to the date after GST Registration is done. Invoice must be after the date of GST Registration. Invoice type must be changed to B2C. The error message, in this case, will be “Invoice number does not exist. Please enter a valid invoice number”. In this case, the JSON file uploaded would not have an invoice number or an invoice number that is acceptable as per GST invoice rules. All the invoices must have GST invoice number. In case there is no invoice number on the invoice, it must be assigned with reference to GST and then re-create the JSON File. In case any invoice is invalid, delete it from the JSON and re-upload. “The rate entered is not valid according to the rate list” is the message that will appear in this case. One should check that all the invoices are carrying valid GST Rates. All invoices must have correct GST Rates. % should not be mentioned with the GST rates in the JSON File. CGST and SGST rates must be broken down and mentioned correctly. The message will be “The place of supply and state code of the supplier should be different for interstate supply”. It is essential to know that the JSON file has the correct place of supply and the state code mentioned in the Place of Supply is correct. Make sure that all the invoices have correct State code in the JSON File. Check if POS code is the same as the supplier’s state when CGST and SGST are collected. This message would be shown when IGST is not mentioned correctly for intra-state supply and CGST and SGST is wrongly mentioned for inter-state supply. Use the error report on LEDGERS GST Software to fix the incorrect invoice. Invoices must have the proper place of supply. Change place of supply must match with the GST charged.